Perhaps others also have this habit, to pick up a book and randomly open a page to read one paragraph or two. This morning I picked up the book called, "The End of Science" by John Horgan. This is a good example of a non-fiction book which can be read randomly from anywhere as it comprise of many brief and assorted sub-sections. After reading one of these sub-sections which I stumbled upon in random opening, I went back to check the Table of Content and my attention caught upon this content called: The Meaning of the Zahir which was part of the Second Chapter: "The End of Philosophy." Now this was unexpected. Zahir is a Quranic term and pre dates even the Quran because of the term's existence in the ancient Arabic language and culture. End of Science is a book that borders at science and philosophy 'examining the limits of knowledge in the twilight of the scientific age'. So a term like Zahir making its way into the Table of Content of such a book by an America writer who writes for Scientific American was a pleasant surprise. This is what the sub-chapter reads, titled "Fearing the Zahir." One of my favorite literary philosophers is the Argentinian fabulist Jorge Luis Borges. More than any philosopher I know of, Borges has explored the complex psychological relationship that we have toward the truth. In "The Zahir" Borges told the story of a man who becomes obsessed with a coin he receives as change from a store-keeper. The seemingly nondescript coin is a Zahir, an object that is an emblem of all things, of the mystery of existence... it grips the mind of the beholder until all other aspects of reality becomes insignificant, trivial. At first, the narrator struggles to free his mind of the Zahir, but he eventually accepts his fate. "I shall pass from thousands of apparitions to one alone: from a very complex dream to a very simple dream. Others will dream that I am mad, and I shall dream of the Zahir. And when everyone dreams of the Zahir day and night, which will be a dream and which is a reality, the earth or the Zahir?" The Zahir, course, is The Answer, the secret of life, the theory to end all theories. This brief reading made me interested to read The Zahir by Jorge Luis Borges which is a short story by the Argentine writer from his book, The Aleph and Other Stories, first published in 1949, and revised by the author in 1974. The One whose nature and existence is demonstrated in all of creation. The One whose essence and attributes are shown throughout all of creation. The One who is above creation, yet who is made visible through creation. Ma lakum la tarjoona lillahi wa qara? What is the matter with you that you fear not the greatness of Allah? And this was how the beginning and end of the sub-chapter Fearing the Zahir read: "Of course, philosophy will never really end. It will simply continue in a more overtly ironic, literary mode, like that already practiced by Nietzsche, or Wittgenstein, or Feyerabend... Popper, Kuhn, and Feyerabend tried to protect us from the Answer with doubt and reason, Borges with terror." And the very story of Jorges Luis Borges which explore this awe inspiring, almost like a holy fearsome quality of Zahir. Below is the highlight part from the short-story, El-Zahir (translator unknown). 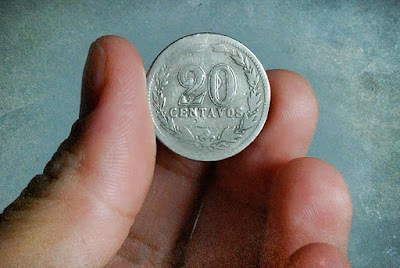 In Buenos Aires the Zahir is a common twenty-centavo coin into which a razor or penknife has scratched the letters N T and the number two; the date stamped on the face is 1929. (In Gujarat, at the end of the eighteenth century, Zahir was a tiger; in Java a blind man in the Sukarta mosque who was stoned by the faithful; in Persia, an astrolabe that Nadir Shah ordered thrown into the sea; in the prisons of Mahdi, in 1892, a small compass, wrapped in a shred of cloth from a turban that Rudolf Karl von Slatin touched; in the synagogue of Cordoba, according to Zotenberg, a vein in the marble of one of the twelve hundred pillars; in the Jewish quarter of Tetuan, the bottom of a well.) Today is the thirteenth of November; last June 7, at dawn, the Zahir came into my hands; I am not the man I was then, but I am still able to recall, and perhaps recount, what happened. I am still, albeit only partially, Borges. It was about two o’clock, I guess, when I stepped into the street. Outside, the predictable ranks of one- and two-story houses had taken on that abstract air they often have at night, when they are simplified by darkness and silence. Drunk with an almost impersonal pity, I wandered through the streets. On the corner of Chile and Tacauri I spotted an open bar-and-general-store. In that establishment, to my misfortune, three men were playing truco. In the rhetorical figure known as oxymoron, the adjective applied to a noun seems to contradict that noun. 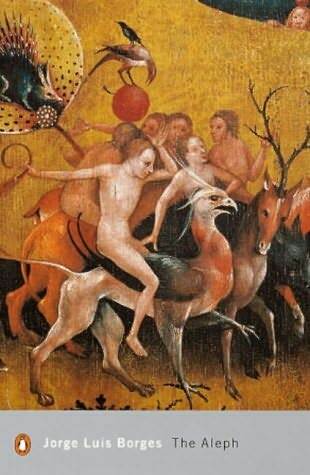 Thus, Gnostics spoke of a “dark light”; and alchemists of a “black sun”. Departing from my last visit to Teodolina Villar and drinking a glass of cheap gin in a corner bar-and-grocery store was a kind of oxymoron: its very vulgarity and accessibility were what tempted me. (The fact that men were playing cards in the place increased the contrast.) I asked the owner for an orange gin; with the change I was given the Zahir; I looked at it for an instant, and then walked outside into the street, perhaps with the beginnings of a fever. The thought struck me that there is no coin that is not the symbol of all the coins that shine endlessly down throughout history and fable. I thought of Charon’s obolus; the alms that Belisarius begged; Judas’s thirty pieces of silver; the drachmas of the courtesan Lais; the ancient coin proffered by one of the Ephesian sleepers; the bright coins of the wizard in the 1001 Nights, which turned into disks of paper; Isaac Laquedem’s inexhaustible denarius; the sixty thousand silver coins, one for every verse of an epic, which Firdusi returned to a king because they were not gold; the gold doubloon nailed by Ahab to the mast; Leopold Bloom’s unreversible florin; the Louis that betrayed the fleeing Louis XVI near Varennes. As though in a dream, the thought that in any coin one may read those famous connotations seemed to me of vast, inexplicable importance. I wandered, with increasingly rapid steps, through the deserted streets and plazas. Weariness halted me at a corner. My eyes came to rest on a weathered wrought-iron fence; behind it I saw the black-and-white tiles of the porch of La Concepción. I had wandered in a circle; I was just one block from the bar where I’d been given the Zahir. I turned the corner; the dark facade at the far end of the street showed me that the establishment had closed. Sleepless, possessed, almost happy, I reflected that there is nothing less material than money, since any coin (a twenty centavo piece, for instance) is, in truth, a panoply of all possible futures. Money is abstract, I said over and over, money is future time. It can be an evening just outside the city, or a Brahms melody, or maps, or chess, or coffee, or the words of Epictetus, which teach the contempt of gold; it is a Proteus more changeable than the Proteus of the Isle of Pharos. It is unforeseeable time, Bergsonian time, not the hard, solid time of Islam or the Portico. Adherents of determinism deny that in the world there is only one possible event, ed ist an event which could have happened; a coin symbolizes our free will. (I did not suspect that these “thoughts” were an artifice against the Zahir and a first manifestation of a demoniacal power.) After long and tenacious musings, I at last fell asleep, but I dreamed that I was the pile of coins guarded by a gryphon. The next day I decided I’d been drunk, I also decided to free myself of the coin that had so affected me. I looked at it; there was nothing particularly distinctive about it, except those scratches. Burying it in the garden or hiding it in a corner of the library would have been the best thing to do, but I wanted to escape its orbit altogether, and so preferred to lose it. I went neither to the Basilica del Pilar that morning nor to the cemetery; I took a subway to Constitución Station and from Constitución to San Juan and Boedo. On an impulse, I got off at Urquiza; I walked toward the west and south; I turned left and right, with studied randomness, at several corners, and on a street that looked to me like all the others I went into the first tavern I came to, ordered a gin, and paid with the Zahir. I half closed my eyes behind the dark lenses of my spectacles, and managed not to see the numbers on the houses or the name of the street. That night, I took a sleeping pill and slept soundly. Until the end of June I distracted myself by composing a tale of fantasy. The tale contains two or three enigmatic circumlocutions: “water of the sword”, it says, instead of blood, and “bed of the serpent”, for gold, and is written in the first person. The narrator is an ascetic who has renounced all commerce with mankind and lives on a moor. (The name of the place is Gnitaheidr.) Because of the simplicity and innocence of his life, he is judged by some to be an angel; that is a charitable sort of exaggeration, because no one is free of sin. ... I have said that composing that piece of trivial nonsense (in the course of which I interpolated, with pseudo erudition, a line or two from the Fafnismal) enabled me to put the coin out of my mind. There were nights when I was so certain I’d be able to forget it that I would willfully remember it. The truth is, I abused those moments; stating to recall turned out to be much easier than stopping. It was futile to tell myself that that abominable nickel disk was no different from the infinite other, inoffensive disks that pass from hand to hand every day. Moved by that reflection, I attempted to think about another coin, but I couldn’t. ..
On July 16, I acquired a pound sterling; I didn’t look at it all that day, but that night (and others) I placed it under a magnifying glass and studied it in the light of a powerful electric lamp. Then I made a rubbing of it. The brilliance and the dragon and St. George availed me naught; I could not rid myself of my idée fixe. In August, I decided to consult a psychiatrist. I did not confide the entire absurdity of the story to him; I told him I was tormented by insomnia and that often I could not free my mind of an object, any random object, a coin, say. A short time later, in a bookshop on Calle Sarmiento, I exhumed a copy of Julius Barlach’s Urkunden zur Geschichte der Zahirsage (Breslau, 1899). Its first undisputed witness was the Persian polymath and dervish Lutf Ali Azur; in the corroborative pages of the biographical encyclopaedia titled Temple of Fire, Ali Azur relates that in a certain school in Shiraz there was a copper astrolabe “constructed in such a way that any man who looked upon it once could think of nothing else, so that the king commanded that it be thrown into the deepest depths of the sea, in order that men might not forget the universe.” Meadows Taylor’s account is somewhat more extensive; the author served the Nizam of Hyderabad, and composed the famous novel Confessions of a Thug. In 1832, on the outskirts of Bhuj, Taylor heard the following uncommon expression used to signify madness or saintliness:“Haber visto al Tigre” (Verily he has looked on the tiger) He was told that the reference was to a magic tiger that was the perdition of all who saw it, even from a great distance, for they continued to think of it till the end of their days. Someone mentioned that one of those unfortunates had fled to Mysore, where he had painted the figure of the tiger in a palace. Years later, Taylor visited the prisons of that kingdom; in the jail at Nithur, the Governor showed him a cell on whose floor, walls and vaulted ceiling a Moslem fakir had designed (in fantastic colors, which time, rather than erasing, refined) of an infinite tiger. It was a tiger composed of many tigers, in the most dizzying of ways; it was crisscrossed with tigers, striped with tigers and included seas and Himalayas and armies that resembled other tigers. The painter had died many years before, in that same cell; he had come from Sind or perhaps Gujarat and his initial purpose had been to draw a mapamundi. Of that purpose there remained some vestiges within the monstrous image. Taylor told this story to Muhammad al-Yemeni, of Fort William; al-Yemeni said that there was no creature in the world that did not tend toward becoming a Zaheer (Taylor writes the word this way), but that the All-Merciful does not allow two things to be a Zaheer at the same time, since only one is capable of entrancing multitudes. He said that there is always a Zaheer and in the Age of Ignorance it was the idol called Yahuk (see Ref #), and then a prophet from Khorsasan who wore a veil studded with precious stones or a mask of gold. He also noted that God is inscrutable. ... Time, which softens memories, only makes the memory of the Zahir sharper. First I could see the face of it, then the reverse; now I can see both sides at once. It is not as though the Zahir were made of glass, since one side is not superimposed upon the other; rather it is as though the vision were spherical and the Zahir flutters in the center. Whatever is not the Zahir appears to me filtered and distant .. Tennyson said that if we could but understand a single flower we would know who we are and what the world is. Perhaps he was trying to say that there is nothing, however humble, that does not imply the history of the world and its infinite concatenation of causes and effects. Perhaps he meant that there is no deed, however humble, that does not imply universal history and its infinite succession of effects and causes. Perhaps he meant that the visible world is complete in each representation, just as Schopenhauer tells us that the Will expresses itself entire in every person. The Kabbalists believed that man is a microcosm, a symbolic mirror of the universe; as would everything, according to Tennyson. Everything, even the unbearable Zahir. Before the year 1948, Julia’s fate will have overtaken me. I will have to be fed and dressed, I will not know whether it’s morning or night, I will not know who Borges was. Calling that future terrible is a fallacy, since none of the future’s circumstances will in any way affect me. One might as well maintain that the pain of an anesthetized patient whose skull is being opened is terrible. I will no longer perceive the universe, I will perceive the Zahir. According to Idealist doctrine the verbs “to live” and “to dream” are rigorously synonymous; as for me, thousands of appearances will become one; a very complex dream into a simple one. Others will dream that I am mad, while I dream of the Zahir. When every person on earth thinks, day and night, of the Zahir, which will be dream and which reality, the earth or the Zahir? In the deserted hours of the night I am still able to walk through the streets. Dawn often surprises me upon a bench in the Plaza Garay, thinking (or trying to think) about that passage in the Asrar Nama where it is said that the Zahir is the shadow of the Rose and the rending of the Veil. I link that pronouncement to this fact: In order to lose themselves in God, the Sufis repeat their own name or the ninety-nine names of God until the names mean nothing anymore. I long to travel that path. Perhaps I will succeed in wearing away the Zahir by thinking and re-thinking about it; perhaps behind the coin is God. # Ref: Barlach observes that Yaúq figures in Alcorán (LXXI, 23) and that the prophet is Al-Moqanna (the Veiled One) and that no one, except Philip Meadows Taylor's surprising correspondent, has associated them with the Zahir. > To read the full version of the short story El-Zahir in English translation click here. God is where all opposites meet. 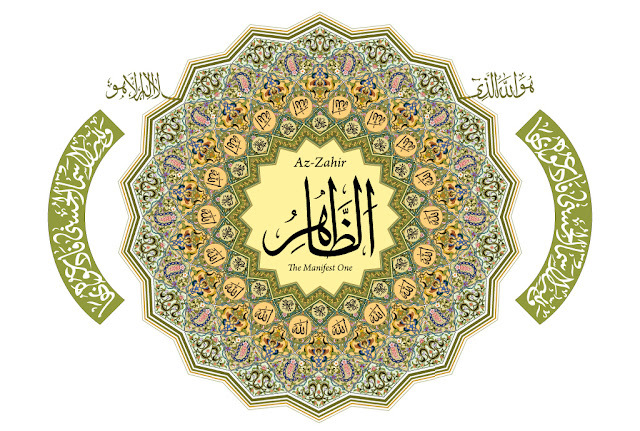 Thus God who is ever Transcendent and Hidden, symbolized by the Divine Name al-Batin, the opposite of which is the ever Immanent and Manifest, al-Zahir. These two qualities comes together in the Revelation of the Quran. The ancient root of z-h-r points toward that which goes from the center and spreads out, disperses or radiates into being, which is to say that it becomes outwardly manifest. Zâhir (manifest) and Bâtin (hidden) are complementary attributes. Zâhir is that which is outward, manifest, apparent, visible. Bâtin is that which is inward, concealed, obscured. Zahir is one of the Most Mysterious Names of God. It is mysterious because it boldly affirm the truth that divine manifestation is to be found in the very creation. Thus Zahir is the Holy Name that calls for the inner eyes to behold the revelation of God Himself stamped upon every drop, upon every face, upon every flower. - After Ishraq prayer, calling 500 times the Name "Ya Zahiru", (meaning "O the Manifest One") Allah shall illuminate both the outward and inward eyes (nur in the qalb). 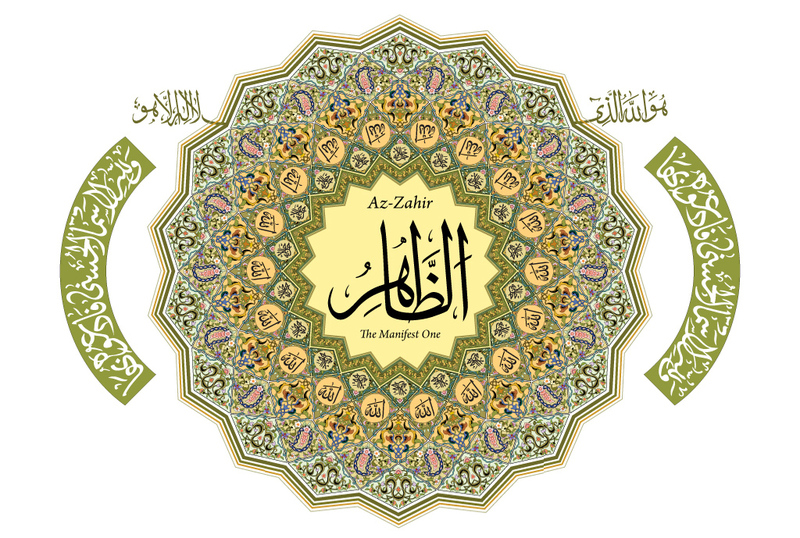 - Desire of one's heart is fulfilled in regularly reciting this Name, "Az-Zahiru" after the Night Prayer (Salat al-Isha), 500 times. - Enlightenment will come, God willing, to those who recite "Ya Zahiru" 15 times after performing the Friday mid-day prayer (Salat al-Jumah). 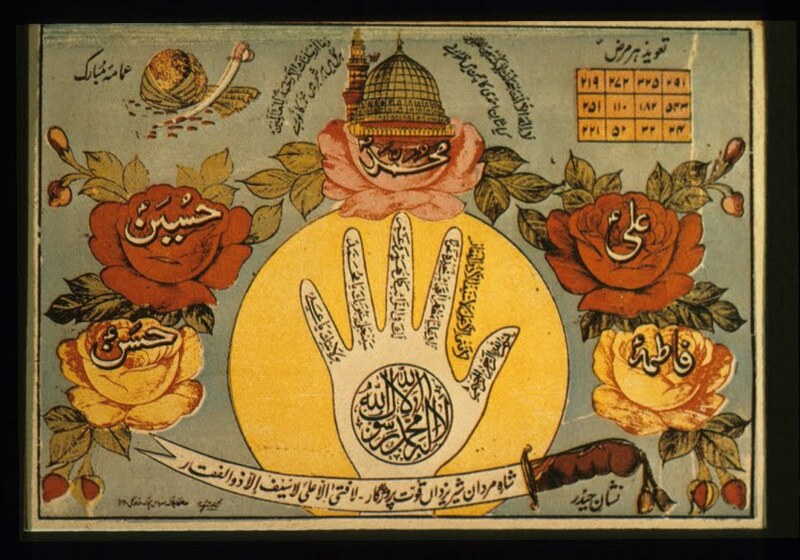 The Sufi thematic short story of Zahir also recalls one of the very interesting aspect of Islamic esotericism. The main character of the story becomes intoxicated by the Zahir. There is a term called Madzub (also written as Madhzub) or Divinely mad one. It is a condition which seize upon the author in the story; whereas for the Madzub who are so overwhelmingly captured by God, the Splendor and Magnificence of God that it obliterate every other existence and they drown in only that Single Existence which is the heart of all that exists. "Zahir .. when it grips the mind of the beholder until all other aspects of reality becomes insignificant, trivial." This condition is spoken in the Quran as "Wheresoever you turn is the Face of God." "Remember Allah abundantly, in order that you become successful (for real)." Wazkuri isma rabbika wa tabattal ilayhi tabteela. And remember the Name of your Lord and devote yourself to Him exclusively. The hadith has it preserved on remembrance "he who loves something remembers it much." The Messenger of God also has this saying, "Remember the name of God so much that people may think of you as mad (majnun)." This is the situation of the Madzubs, the mad ones of God. And Borges writes it beautifully when he says: "thousands of appearances will become one; a very complex dream into a simple one. Others will dream that I am mad, while I dream of the Zahir." how am I to recognize Him? Sri Ramakrishna, when he was asked, "Its heard that you claim that you see God, is that true?" And the great sage replied, "I see God as clearly as I see you." Hazrat Umar, one of the foremost companion is famously said, "I have seen my Lord with the eyes of my heart." It is the mystical recognition of God in this very world is the pre-cursor to behold His vision in the post-resurrection reality, in the hereafter. Those who fail to recognize God here, those who sees not God here in His creation, will be raised blind similarly and the key to attain that vision is remembrance of God and in that remembrance the vision of the eyes of inner heart become alive. The failure of beholding the vision of God here means the mirrored reality in the post resurrection will also render the eye of the spirit blind. Zahir is the very Name within which resonates this call, "Lift Up Your Veil And Meet Your Beloved." It takes the grace and tremendous longing of the Divine that opens the eyes of the heart to meet the Beloved, to behold Him wheresoever we turn in this very existence. mone hoe nato sheje kache nai. has made me oblivious that He is beyond sight. shall bid Him to me. with hopeful longing of the Unknown. He brought the cosmos into existence upon His own Form. Hence He is a mirror within which He sees His own Form. ...Thou art His Form and He is Thy spirit. I am the mirror of Thy Face, through Thine own eyes, I look upon Thy Countenance. If you see yourself in the mirror, then all you worship are your own thoughts; but if you see God in the mirror, then God is seeing Himself in you. * The Zahir (Jorge Luis Borges / 4Buddhas): A student movie inspired by short story of Jorge Luis Borges made for film festival at Faculty of Informatics, Masaryk University in Brno, Czech Republic.